The soup is safely possible to name this dish which is served in almost every home. For cooking chicken soup, you do not need a lot of time preparing these first courses very easily, and eaten with great pleasure. 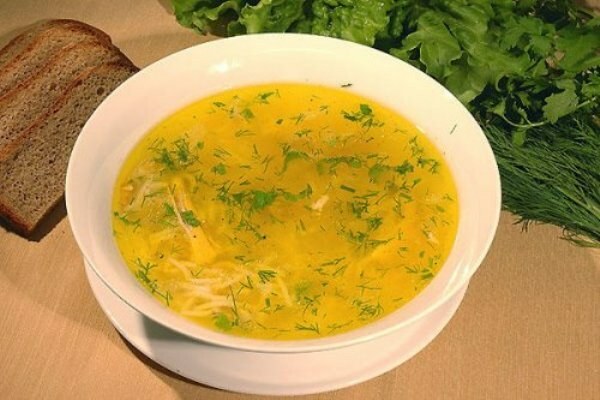 For cooking delicious chicken soup with noodles, take a chicken, wash it and cut into several parts of smaller size. Put the meat pieces in a saucepan, cover with water and cook until tender, not forgetting to salt the broth to taste. While the chicken is cooking, peel, wash and finely chop the onion. Wash the carrots and grate it on a coarse grater. Sauté onions and carrots in the pan in a small amount of vegetable oil. Potatoes wash, peel and cut into cubes. When the chicken is almost ready, put the broth, potatoes and cook it 10 min. Then add to the pan zazharku of carrots and onions and let the soup simmer on low heat for another 7-10 minutes then add the noodles and simmer the soup until it's done. Make sure that the noodles don't seethe! A few minutes before end of cooking add the dish with the Bay leaf, pepper, parsley and dill to taste. Turn off the heat and leave the soup a little brew under a lid. In order to enjoy the delicious pea soup from chicken, soak the peas overnight, then put it to boil, adding baking soda on a knife tip - this trick will allow the peas to turn to mush. After 15-20 minutes, put pre-washed and chopped into small pieces the chicken and salt the broth to taste. Rinse and cut into cubes onions. Grate the washed carrots and saute prepared vegetables in vegetable oil, and then add them in the prepared dish. Now clean pre-washed potatoes, cut them in cubes and after 5-7 min after adding the contents, put in a saucepan. Simmer the soup until tender about 10-15 minutes Before you serve the dish on the table, decorate it with chopped fresh herbs to taste.